A couple weeks ago, several of you answered my request for blog feedback, and I’m so glad you did! But apart from amusement and appreciation, I came away from the survey experience with the clarity I was seeking. Specifically, an answer to the question of what exactly you liked reading in my corner of the Interwebs and if I should put energy into creating an online writing class. Enough of you (nearly half, actually) said you might be interested in taking a class with me that I’m now brainstorming ways to make it happen at an affordable price. Stay tuned for that (although if you’re eager, please do drop me a note and we can figure something out). But I especially loved seeing the responses to what you want to read. Often this whole blogging thing is a bit scattered. Fingers poised over the keyboard, I think of writing about my morning walk along the snowmobile tracks down the centre of the Saskatchewan River and… stop. They don’t want to hear about that, I think. Well, turns out you do. 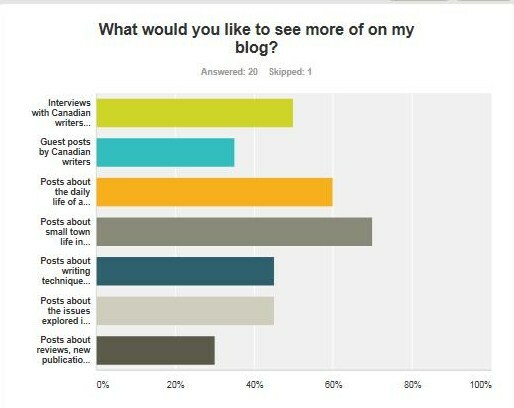 In fact, posts about small town life in Northern Manitoba was your number one request (who knew? ), followed by those about the daily life of a practicing writer, and then the Firelight Interview Series (which I’m super glad about because I’ve got a whole bunch of incredible Canadian writers already lined up). Posts about writing technique, the issues explored in Swarm, guest posts, and stuff about reviews and upcoming readings and events all fell relatively flat. Which is completely fine, because what I’ve gained from this is invaluable. In a word: focus. I now have an editorial calendar of sorts, so expect to hear more about living up here with the magpies and the long, long winter, as well as rants and reflections on my morning bliss and battles with the new book(s), and the interviews I’m loving doing with writers you might never have heard of (but really should know). And just to keep things interesting I’ll toss in the odd guest post by friends and writers I admire along with news about my career that I can’t stand not sharing. But that’s to be expected because, after all, it was me who dug deep and stuffed this here smattering of words inside the centre of that precious stone (although that analogy of gargantuan effort seems more fitting to me to creating a novel…). Thank you again, and if you haven’t had a chance to share your thoughts, you can still take a few minutes to answer the survey.